Trying to cut back on number of plants, if I do two each, that will be 24 plants. Last year, I had 34 in the raised bed, 8 in The Box, and 6 more in growbags, 48 total. I may start some plants for friends, if they want. Target start date is February 9. So, you like hot peppers, do ya? We have a new controller at work, real nice guy. This afternoon he approached me asking if I sell my peppers. I said yes, but he should realize they are very hot. He said, yeah I got some jalapenos at home. To which I replied, mine are quite a bit hotter. Like Habaneros, he asked. I said, no mine are basically all hotter than Ghost peppers. He said, well my son eats that Ghost pepper sauce, he would probably like them. I replied, before I sell you some, let me give you a few as a sample. 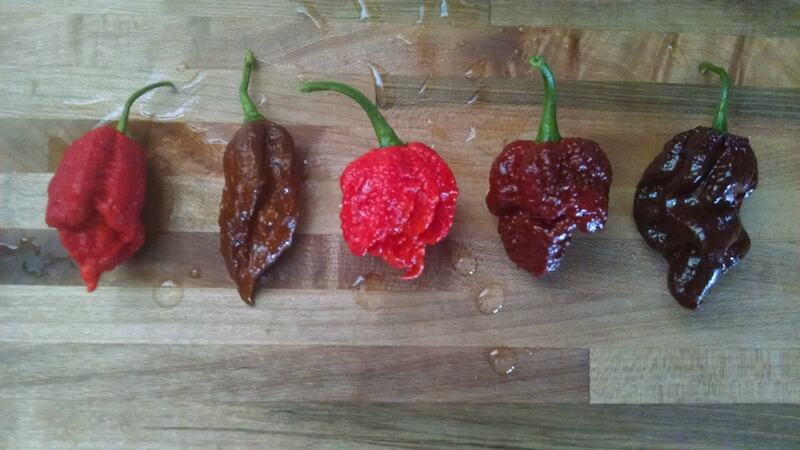 Red CPR, Chocolate NagaBrains #2, Skunk Red, Apocalypse Chocolate, Chocolate Reaper/Scorpion. I wonder which his son will like best? I have never sold any of the peppers I have grown, but I have considered it. I have given away hundreds. Problem is, I have no idea what to charge or how to go about it. I say this upfront; I will never use PayPal, and I understand that is what most everyone uses for Internet sales. For those who have plants started under lights; typically, what are your internodal spacing measurements like? I always seem to have very short, broad plants while under the lights. I wonder if this in any way generally affects how tall the plants will be once they are outdoors and in the ground. Might add a few more.